Congrats Pete! You get a JibJab T and this very ninja! This entry was written by paulhanges and posted on April 23, 2009 at 6:40 pm and filed under Contests with tags contest, free t-shirt, jibjab, luchador, ninja. Bookmark the permalink. Follow any comments here with the RSS feed for this post. Post a comment or leave a trackback: Trackback URL. Hey… is that guy giving us the finger? …the idea that they’re super tiny ‘particles’ like grains of sand is an illusion. In reality, they’re probable locations of a mere ‘idea’ or ‘notion’. The very idea of a tangible paradigm breaks down, because if it’s ALL empyrean, then what point of reference are we using when we think of solid reality? there is none. The above picture is a depressing example of a monster movie with a poor budget. Dude! I told you to bring a “BLACK” mask! 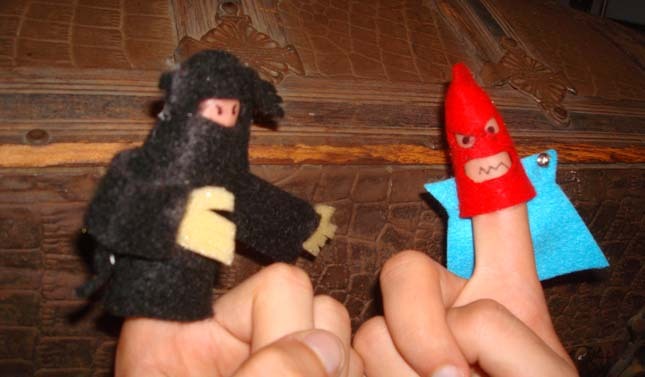 Grrrrr, I must summon the powers of the universe to outwit The Burka Designer and defeat his fiendish sense of style. Aarrggh, here comes Quentin Tarantino again, thinking I won’t recognize him behind an overflowing black Ninja robe. But he will never fool me again! NEVER!!! These dudes just got fingered. Am I right? AM I RIGHT?